TELBANEER olive oil and herbs marinated cheeses bring spices, herbs and cheese together in one product. 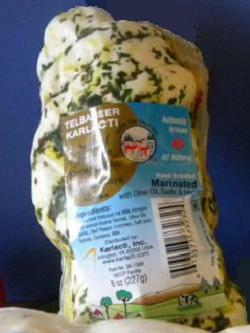 KARLACTI specialty dairy products: handcrafted olive oil and herbs marinated String Cheeses are produced in a HACCP certified facility which ensures constant cheese quality and safety. Handcrafted braided string cheese made with reduced fat milk for great taste and less fat.